I was going through some old pictures and found this one of Tillie. Beth is holding her little kitty paws. I’m not sure what Tillie is looking at, but I thought it was cute and would make a good Camera Critters post. I’m not going to have much time to visit everyone today, but I will try to get around tonight. For today, I am going shopping with Beth. I can’t believe I said yes – I don’t really like shopping, and Fridays are usually really busy, but she called from work yesterday and asked me if I wanted to go shopping, and since we don’t get to see each other or do anything together very often, I said yes. And then this morning, I spent too much time trying to figure out how to get pictures off my cell phone to my computer via Bluetooth – instead of just popping the card out or connecting the phone with the cable. So, now I really need to get ready! Where does the time go? The good news is that I figured it out, and I can send pictures to my computer from my phone. How cool is that? Here’s one of those pictures from my phone. I took this from the car when Jeffrey and I were coming home Sunday. Do you know those commercials for Total cereal? The ones where they compare how many bowls of other cereals you would need to get the vitamins and minerals in one bowl of Total? I always thought they were dumb. After all, you don't need to get all your nutrients for the day in one meal, right? But now I've figured it out - they make Total for people like Beth! She usually eats breakfast, but there's no guarantee that she'll eat the rest of the day or, if she does, what she'll eat. Good thing she likes Total. I've been reading all my life - well, since I was 5 or so - but last year was the first time I thought to keep a list of all the books I read. I used the weRead app on Facebook to keep track of them, adding them when I started reading and then marking them as read when I finished. So, this list is sort of in order. It's in the order I added the books and started reading them, but I didn't necessarily finish them in that order. I tend to have at least a couple books going at once, and some of them were audio books I listened to when I walked. I thought about linking all of them to Amazon books so you could easily click and find out more about any books that interest you, but that was going to take more time than I wanted to spend. It's pretty easy to search Amazon, anyway. Looking at the list, I feel like I should have read more. That might be because I have friends whose book lists are a lot longer. However, when I read that 1 in 4 U.S. adults read no books last year and 80% of U.S. families did not buy or read a book last year, I don't feel so bad. I feel bad for them - how in the world can anyone can survive without reading? I'm already working on the 2009 book list, again keeping track of it on Facebook. They've added a new feature that lets me add tags to my books, so I'm tagging books with the month when I finish them. That will help me keep track of them even better. If you have any book suggestions for my list, you can leave me a comment or 'chuck' them at me on Facebook. Jeffrey and I went and bought TurboTax today, along with a bunch of other software that will be free after rebate. I have a hard time resisting free stuff. Have you noticed? We got several different Internet security titles, a PDF converter, PrintShop 23, and some other stuff. I will have to spend a bit of time reading over rebates and making sure everything adds up, and then putting stuff together to mail, but it's all worth it in the end, right? It will have to wait until at least tomorrow, though. Right now we're watching Ocean's Thirteen. We talked about going to a movie since we were out, but decided to come home and watch some I got from the library instead. We could have watched them on the big screen, so it would sort of been like going to a movie. I could even have made some popcorn, but instead we're just watching on the television - the one on the tv stand in the living room. It's probably too cold to go down in the basement anyway. That's our story, and we're stickin' to it. Here she is again – out resident critter, Tillie. She loves her grocery sack. It’s a place to hide, a place to sleep, a place to play. It’s an all-purpose cat possession. No self respecting cat should be without one. This is my first post for Looking at the Sky on Friday. Click the image to join. This is the view through the sliding glass door in my dining room. Yes, Misty actually goes outside to take her sky pics. I just shoot from inside. Hey – it’s cold out there! Still, nice view, don’t you think? Now, I really need to go through all my pictures – organize them, delete the blurry ones before I have to buy computer memory to keep them all, and get them backed up to CD or DVD. Have you tried these Keebler Flipsides crackers? (Click on the TownHouse crackers) I bought a box a while back but hadn't opened it yet. Cory discovered the box and wanted to try them today. But first he wanted to take a shower, so he left the box with me, so I could try them first. I did. I love them! They're so crispy and yummy. I really need Cory to come back and take this box away from me. This is Beth's last day of high school. She's got one exam and has to get some teachers and administrators to sign her check-out sheet, and then she's all done. How is that possible? How can I have a daughter who's out of high school? What do you buy for a graduation present? Do you think she'd like replica watches or a new pair of shoes? Luckily I have a few months to figure that out. She may be finished with classes and exams, but she's not actually graduating until June, with her class. In the meantime, she's just out of school. I hope she remembers to pay the money she owes on the lunch account. The kids went back to school today. Even though they missed two days of school last week, exams are still scheduled as originally planned. I'm not sure what Beth's schedule is, but Cory has two exams tomorrow - well, one is just a 'culminating activity' in Phy. Ed. Then he has two on Wednesday, and he's out of school for the rest of the week. Another four day weekend! Whatever Beth's exam schedule is, she's finished with high school when she finishes her exams. Can you believe that? She's working all the rest of the week 2-10pm, and then next week she can work even more. She says she's scheduled 35 hours next week. I just realized this short week means I need to send the next payment for the New York trip with Cory either tomorrow or Wednesday. The good news is, Cory's portion is covered with trip points this time, and I now have some nice luggage to use for the trip. It was on sale at Kohl's, and Jeffrey had a 20% coupon on top of that - so he got a nice set of luggage for under $60 today, 3 rolling suitcases, a tote, and a toiletrie bag. It may not be the best quality, but for the amount of travel we do, it will be fine. And it's certainly better than the old suitcases we've had for years. At least these won't fall over when we roll them! Suitcases are designed so much better nowadays. It will be interesting to see how or if they change things next week. They've got finals scheduled for the end of the week, but missing a couple days of school has interfered with reviews and such. Cory has some of his review assignments at home so he can work on them, and he's got his art project here to finish, but some other things are still at school. So, I wonder if they'll adjust things a little? Beth is home. She had to go to work this afternoon and work 'till close. The cold air is moving in - wind chills supposed to be way below zero from tonight until noon on Friday. There are already over 300 closings and delays reported, and our school is one of them. I'm sure the kids will be happy. They won't have to get up in the morning. I think, for once, I'm going to stay warm and comfy in bed, too - at least for a while. It will definitely be too cold to go walking. Sure, I wear layers and bundle up, but still that's a little cold. If I didn't wear glasses, I might be able to go out in colder weather. The problem with glasses, you ask? You can't cover up your face to keep it warm. I can cover my mouth, but as soon as I cover my nose too, my glasses fog up and I can't see. If I need to blow my nose, and I start breathing through my mouth, then my glasses fog up. It's kind of hard to walk if I can't see. So, no school and no walking tomorrow. Cory came home Wednesday and said one of the girls who was supposed to be working concessions on Thursday couldn't do it, so he said he would. 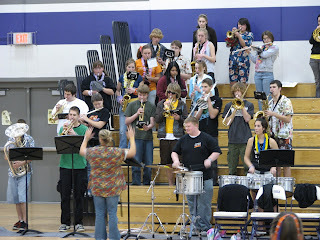 The band students get 10 points/hour when they work concessions, and for a basketball game it's 4 hours and 40 points. That will help pay for that trip to New York. Then we found out it was a wrestling meet and only 2 hours. 20 points is better than nothing, right? Except that Cory thought I should take him to Subway for dinner first so he could try that new $5 footlong, the Buffalo Chicken. So, 2 subs at Subway, 1 for me and 1 for Cory - $10 plus tax. Then, while working concessions, Cory wanted a Gatorade and some candy - another $2. So, for 20 points (which translates to $20 when cashed in for the trip) I spent $12. On the other hand, wrestling isn't a really big draw so there weren't many people there and not much to do. They really didn't need me there, but for only 2 hours I didn't see any point in taking Cory over there and then having to go back to pick him up later. We watched some of the wrestling, which was really disturbing. Seriously, what is up with that sport? I read my book and just hung out with Cory and Jestine. And we were done a little after 8pm. This may not seem like the time to ask whether or not the Air conditioning compressor in your car is working or not. After all, winter has just started, and it's cold outside. You're more worried about the heat, right? Now would probably be a good time to think about that auto air conditioning, though. If it needs fixed, you can get it fixed before summer sneaks up on you and it gets hot. For those of you who live in Florida, that's next week, right? You don't want to be driving down the road with the windows rolled down and the sweat running into your eyes, do you? For the best selection of auto air conditioning parts, with free shipping and full warranties, check out 1airconditioning.com. It sounds like they do everything but install it, but with their low prices, you should be able to afford the installation charges. If you know how to do it yourself or have a friend who does, even better. I'm crossing my fingers (and my toes) hoping that I got the irritating little virus, worm, Trojan, whatever off of my computer. My brother suggested I try Malwarebytes. I figured I'd try scanning with Norton first, so left the computer scanning overnight. It didn't work. I think once the scan found the bad file, it stopped or something, because it was just sitting there when I got up this morning. So, I went ahead and downloaded the free version of Malwarebytes, and after some messing around and frustration, I'm hopeful that I took care of it. If you want the details, you can go here. Jeffrey has been having even more problems with his computer the last couple weeks, so we are going to have to try this on his computer, and Beth's too. Even if you don't have a problem yet, you might want to go ahead and get this program, because once you get one of these bad boys on your computer, they don't like you to download or install a program that might stop them. Jeffrey has repeatedly tried installing some other programs, and his attempts have been blocked every time. This seemed like a quick download and install that will hopefully get through, but if you've already got it on your computer, you won't have to worry about that. We have VOIP. That means, for $24.99 a month, plus taxes and fees, we have unlimited long distance to the US and Canada, among other things. Now, does that mean I pick up the phone and call anyone? I'm so bad. I'm paying for it anyway so I really should use it, but I don't. If someone calls me, I'm more than happy to talk. It's just the picking up the phone to make a call. Don't ask me why, I don't know. Because of this, I'm always looking for ways that let other people make free calls so they can call me. Today I tried CallingAmerica.com to see how that would work. Anyone with a broadband internet connection and a headset can make calls for free. The service is supported by advertising, so the person who places the call has to listen to a short ad, but the person on the other end of the call won't hear it. They just get a call on their cell phone or landline, just like any other call. If you register, for free, you can place as many calls as you want. The calls are limited to 15 minutes, which could be a good thing because you might actually get off the phone and get something done. Otherwise, if you still have things to say, you can make another call. If you don't register, you can only make a 2 minute call. I guess that's enough to say, "Call me back with your unlimited long distance!" but that's about it. So, to really get some use from CallingAmerica.com, registering would be a good idea. If you don't have your own unlimited long distance, this may just be the service you're looking for. I didn't register because, like I said, I'm already paying for VOIP, but I am going to remember this site. One of these days I may be away from home and need to make some phone calls. We have been known to take our phone adapter with us, just in case, but this would be much easier. For some reason I'm having the hardest time thinking of what I want to say. I've been struggling with Heads or Tails today, even though it should have been pretty simple. The prompt for the day was, 3 things you learned in 2008. It was an entire year - you'd think I'd have learned a thing or two, or even three. So why can't I come up with a simple list? No, I'm trying to come up with some earth-shattering intense things I learned. Maybe I need to learn not to over think things. And maybe I should just be thankful nothing is all that earth-shattering and intense. On that note, I learned (this is #1) that my daughter, Beth had something wrong with her heart. That could've been really serious. And scary. Yes, it was a little scary, for all of us - especially Beth. But, she had the procedure last week. It went really well, and she's back to her normal life. The bruises haven't faded yet, but they're going. Thankfully, it was (relatively) easy to correct, and there's only a 3% chance it's not completely and totally fixed. That means 97% that she will never have to worry about that again. Also in 2008, I learned (this is #2) - well, I keep starting that sentence, "I learned _________." But then I stop and think, but I already knew that. I'm not saying that I already knew it all. Maybe it's that some things I just have to learn over and over before I actually get it? Or maybe once I figure something out it seems so obvious I can't believe I didn't know it before? Somewhere along the line I learned (this is #3) that I better write stuff down, or post it to my blog, in order to remember. I bet if I took the time to read through all my entries for 2008, all 851 of them, I would have found it a whole lot easier to come up with three things I learned in 2008. I ought to start a new label for my blog - 'something I learned' - and try to use it on a regular basis. That way I'll be good and ready for next year's '3 things you learned' - or whatever number Barb comes up with! I know it's late, but it is still Tuesday. I learned the days of the week in some previous year, though, so I couldn't use that for this post. Heads or Tails is a fun weekly meme hosted by Skittles, and it's not too late for you to join in, too. I just joined a new consumer network called acobay. It's like a social network, only with stuff. What that means is you add the things you have to your account, rate them, review them, and even upload photos. Then, you can connect with and make friends with other people who have the same stuff you do. I added my digital camera and my cell phone to my stuff, but I haven't connected with any people yet. I'm not sure that's really what I want out of this, considering I have enough friends to keep up with on Facebook. What I think is going to be helpful about acobay is the ability to see what other people think about the stuff they have. For instance, when I or one of the kids is ready to get a new cell phone, we can find people who already own that phone and see what they think of it. The same goes for new cameras, televisions, MP3 players, cars, books, and even restaurants. Just add the item to your wishlist and join the discussion. Oh, I should add my MP3 player! Back when I first got it I was having trouble getting it to work with some of the audio books I downloaded from the library. I searched all over the Internet trying to find some answers, but didn't have much luck. A network like acobay would have let me ask the people who owned the same MP3 player to see if they had the answers. Now that I've figured it out, when I add the player to my stuff, other people will be able to ask me. I'm also thinking this could be a very handy way to inventory all the stuff we have. You know how you're supposed to do that for insurance purposes? I keep meaning to do that. So far, the only thing I don't like is that I have to put a price in when I add stuff. If I start adding as I acquire, that won't be a problem. I love telling people what a deal I got, but for the stuff I've had a while, I really don't remember. That's pretty minor, though compared with all the possibilities. What are you waiting for? Go add some stuff! Facebook is a real time waster, isn't it? At least it can be. Don't get me wrong, I love it. I love that I've been able to reconnect with people I haven't seen in years, and I love that I'm now in touch with all kinds of cousins and family members I haven't seen in years, either. I'm pretty sure I have more friends on Facebook than I have in real life - except that all my Facebook friends are my friends in real life, or at least they were at one time, or we're related. So, I find myself on Facebook throughout the day, checking to see what everyone is up to, looking through old (and new) photos, thinking I really must get my scanner to work so I can add some too, commenting on said photos and status updates, and now playing Lexulous. I don't think all that is quite as bad as the new game Cory's dear Aunt Cindy has gotten him playing. It's called MouseHunt. Have any of you heard of it? I don't really understand it, and I'm not really trying because this game seems to take a lot of time. This morning before school Cory asked me if I could do him a favor. He wanted me to go into his room periodically throughout the day and blow his hunter's horn for him so he could catch a mouse, or something. From what I could see, it was pretty random, but I did it several times throughout the day because I'm a nice mom like that. And because Tillie was lying in there on Cory's bed, so I had to stop in and pet her when I walked by. While I was in there, I might as well click, right? One of those times, Tillie came over to the computer to see what I was doing and climbed up on the desk. So, I figure since she's a cat, and the game is all about hunting mice, then Cory should teach her how to play it for him. Sounds reasonable, right? And it will save me some time in the future, assuming he's going to keep playing the game. It may be a waste of time, but Cory has really been enjoying playing the game and spending time with his aunt (and his uncle) while playing it. I even got to talk to Cindy for a little bit today when she asked Cory why he wasn't in school. He has also started talking about Doctor Who with one of my (his) cousins he's never met. Facebook may not be quite the same as a family reunion, but it's better than nothing. Now, I need to go whup my mom at Lexulous! Jeffrey and I walked a little later than normal on Tuesday. Because of Beth's surgery, he wasn’t leaving for work as usual. So, instead of walking in the dark like we normally do this time of year, we got to enjoy the sunrise and had some light to enjoy our surroundings. I walked out the door to see this sunrise, turned back around and grabbed my camera. There he is up ahead of me, so I have to run to catch up. He says he’s walking for exercise, not to take pictures. Does he even know what he’s missing? Look at that sky!